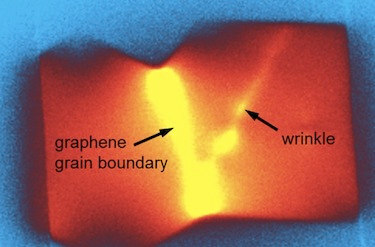 Researchers at the University of Illinois Urbana-Champaign and the Oak Ridge National Laboratory declared their discovery on heating of the grain boundaries in a graphene sheet (the nanoscale defects where individual grains of graphene “stitch” the sheet together) when the material is made into a functioning transistor. While this new discovery implies potential for early device failure, the defects themselves might be exploited to make phase-change memories and better graphene-enhanced sensors. The team measured the nanoscale temperature increases in hexagonal grains of graphene grown by CVD using a technique called Joule Expansion Microscopy (SJEM) - a thermometry technique that works using an atomic force microscope (AFM). The tested graphene transistor was coated with a layer of polymer that expands upon transistor heating, measuring graphene’s expansion and converting the expansion into temperature increase by careful calculations. A significant temperature rise (150-300% more than the rest of the sheet) was spotted in the grain boundaries, most likely to have been caused by the resistivity of the grain boundaries and the fact that current flows non-uniformly across them. This discovery is important for three main reasons: Taking the heating into account when designing future graphene-based electronics to avoid hampering device performance, showing techniques like SJEM can be used to study localized defects (which electrical measuring devices are not sensitive enough to do) and having the ability to study how power dissipates along graphene sheets can give a better understanding of the yet unclear physics of such defects. The researchers also declared their focus on studying possible applications that have risen due to their discovery. They claim it will now be possible to to deliberately induce failure of graphene at nanoscale grain boundaries and use these defects to probe phase changes that occur - hoping to exploit them for phase change memories. They also claim it feasible to use localized heating to understand how graphene-based sensors work, in hopes of finding ways improve effectiveness.